Gareth Huw Davies - A message to the future – why were we so quiet about climate change? 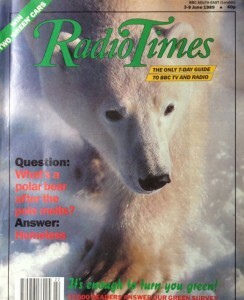 This is the magazine in which I wrote about climate change in 1989. 26 lost years? “’Elephant in the room’ is a metaphorical idiom for an obvious truth that is either being ignored or going unaddressed…also applies to an obvious problem or risk no one wants to discuss.” – Wikipedia. This is a message to my grandson, born in the spring of 2015. I want him to know what we were thinking, and doing, in the year of the important United Nations Climate Change Conference, which will be held three months from now in Paris. And what was I thinking and doing? I would like to think that 18, or 30 or 50 years from now the most doom-laden predictions will have been shown to be unfounded. So extreme weather events did not become more common. We did not have many more fierce droughts and heat waves and storms than usual. Arctic ice stopped retreating so rapidly, just when it seemed we would be able to sail right across it within a few years. 2015 on track to be the hottest recorded year? It turned out to be a record never again beaten. And still we succeeded in developing unimagined technology-based coping strategies, so that the impact on our society and economy from what warming there was, was not anything like as bad as the pessimists had predicted. Or perhaps those bad things did happen, just as the vast majority of scientists working in the field predicted they would, and technology couldn’t develop fast enough to bail us out in such a short timescale. That’s the more likely scenario, unless we take some pretty urgent action.. I think many people know it, but prefer to look away. Pres Obama said this in his State of the Union address in January, 2015: “And no challenge — no challenge — poses a greater threat to future generations than climate change” Yet we spent most of 2015 not talking about the important Paris conference to come. It has been built up by commentators as the world’s last chance to strike an accord to slow global warming. For some months there has been optimistic talk that a deal can be struck, committing world governments to significant carbon reduction targets within a set time, to limit global temperature increase to 2°C. And yet the last time we had such an important meeting, in Copenhagen in 2009, world leaders could not agree on action. My own interest in a subject which affects every single one of us goes back a long time, to 1989, when I wrote an article in Radio Times to accompany one of the very first BBC documentaries on the then little-known subject of climate change. For a time in the early 1990s it seemed that the world would take the required action to significantly cut carbon emissions. However it didn’t work out as we’d hoped – by “we” I mean the many people who took the science seriously and saw very clear dangers ahead. World governments simply weren’t committed. The USA, the world’s biggest polluter of the time, showed little interest in positive action. The science became ever more insistent, and by 2014 and 2015 there was little more we needed to know from scientists and the research organisations. However, instead of driving more news coverage, the subject of climate change and how to address it drifted away from the bulletins and the newspapers, with a few honourable exceptions, notably the Guardian and Independent in the UK. Elsewhere sceptics and deniers writing for certain newspapers continued to argue contradictory views, and even then cherry pick the data that suited their case. At the time I write this, September 2015, climate change is given a low importance by the BBC. Radio 5 Live is a comfort zone for the climatically concerned. It is a rare day when it mentions the subject in its main bulletins, so you can safely close your mind off to this big worry. Sometimes, however the omission is glaring. Consider this example. On September 16, 2015 Sir David Attenborough, a man whose reputation almost compels the media to report his views, was a signatory to an open letter outlining the ambition of the Global Apollo Program, a research initiative to make renewable energy cheaper than fossil fuels within 10 years. This was actually very positive news. Sir David said he thought, if successful, the programme could stop climate change. Yet it didn’t even feature on the main Radio 5 morning news bulletins, where the lead item was the failure of the new leader of the opposition to sing the national anthem. Earlier in the year climate change barely registered as an issue in the 2015 General Election. I suspect most people – and opinion polls show that a majority of the public is concerned or very concerned about global warming. Yet in a day-to-day sense it is a very easy subject to ignore. Many of us still lead comfortable lives in which we are neither too hot nor too cold, and reach our everyday appointments easily enough in car or public transport. If there is meteorological ferment out there, most of us are safe from it most of the time. That said, in a nation said to be obsessed about the weather, our reluctance to talk about climate change and the urgent need for action needs some explanation. Is it because, unlike the months before the outbreak of war in 1939, where people and their homes and property faced an actual, imminent threat, an ill-defined onslaught from the elements at some indefinable future date was something we could shut our minds, and our front doors against? I sense too that, particularly among older people, there was a feeling of the really serious things, whatever they were, were not going to happen in their lifetime. Why should they worry on behalf of generations not yet born, or only just born? There are some honourable exceptions to this “rather not think about it” state of mind. The divestment movement took hold in universities and churches and in local government, around the world. Votes were passed to sell-off shares these various bodies were holding in companies producing and extracting fossil fuels. The Guardian launched its Keep it in the Ground campaign. It is insulting, almost arrogant, to accuse friends and acquaintances of being part of a mass sleepwalk towards disaster because they never talk about climate change, apart from the occasional, inconsequential “Isn’t it terrible” comment. Besides, they aren’t to blame for not making it a conversation-dominating subject. I would attach blame to the media and politicians. Both parties have the power to do something, to inform and to act. It’s hard to be optimistic about a breakthrough in the Paris climate talks, but let’s try. Let’s look past the negative signals the UK Conservative government has been sending since election in May, and take it at its word – that it does intend to be a prime mover in concluding a strong settlement. Will 2015 turn out to have been the pivotal year? Will we finally grasp our predicament, and set a determined course to limit climate change? It could yet happen. Or, once again, will we fudge the biggest challenge of our times?